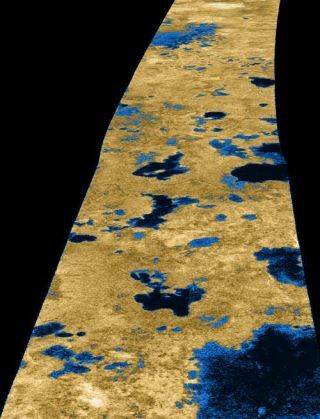 The irregular black shapes in this Cassini radar image of Titan's northern polar region are believed to be liquid methane-ethane lakes. A lake of asphalt may be the closest thing on Earth to thehydrocarbon seas on Saturn's moon Titan, and it isapparently teeming with microbial life. Notonly could these findings help in the searchfor aliens in our own solar system, but they could provide insight into theevolution of life on this planet. The largest naturally occurring asphaltlake on Earth is Pitch Lake on the Caribbeanisland of Trinidad, where black goo oozes across roughly 114 acres, anarea slightly larger than that covered by Vatican City. Brimming as it is with hot asphalt and bubbling with carbondioxide and hydrocarbon gases, Pitch Lake hardly seems fit for life. However,scientists now find eachgram of sticky black goo in Pitch Lake can harbor up to 10 million microbes, includingbacteria as well as other single-celled organisms known as archaea.This life, which dwells in asphalt ranging between 90 to 132 degrees F(32 to 56 degrees C), apparently feeds offhydrocarbons. Instead of breathing oxygen, it respires with the aid ofmetals ? perhaps iron or manganese. Theresearchers collected six samples from the lake. "Thetar itself sticks to everything ? imagine really smelly molasses," saidresearcher Steven Hallam, a microbial systemsecologist at the University of British Columbia in Vancouver. Each sample contained a distinct microbial population. Most of thebacteria appear related to ones found in oxygen-depleted sediments, methaneseeps or oil reservoirs. However, some of the archaeathey saw "fall far enough away from known groups as to represent novellineages," Hallam said. Water levels in the asphalt arelow, at or below thereported threshold for life on Earth, so the life the researchers found in thelake might be constrained to watery pockets within the surrounding asphalt,similar to what is seen bound in frozen lakes and glaciers in the McMurdoDry Valleys in Antarctica. The fact that E. coli gut bacteria cangenerate most of their own water and that fungus found in kerosene can extractwater from light hydrocarbons could point to how life can survive even whenlittle to no liquid water is available. Aside from the very cold surface conditionson Titan,the environmental conditions within Pitch Lake are one of the closest copycatsfor that moon that we can find on our planet. The discovery of a broadspectrum of microbes in this lake enhances the possibility for life in Titan?shydrocarbon seas, researchers said. Some of Titan's hydrocarbon reservoirsmight be heated from below, providing energy that potentially enhances the possibility of at least the precursor molecules for life. "An obvious future step is to look at the adaptationmechanisms of these microbes and how they manage to make a living in PitchLake, which will give us also some idea of possible adaptation mechanisms forputative extraterrestrial life on Titan," said researcher Dirk Schulze-Makuch, an astrobiologist atWashington State University who also is involved in this project. Theprospect of life on Titan is exciting "becauseif we find life there, it most likely would be of a separate origin, which wouldgreatly inform us how diverse life truly can be and would also greatly increasethe chances of finding life outside of our solar system," Schulze-Makuch added. Future research could tease out the genes these microbes rely onto live off the hydrocarbons and metal in this asphalt. Doing so could shedlight on potential alien life, and even lead to new life-detection tests thatlook for a broader array of biomarkers. This research also could be useful in the quest to make energysources on Earth less polluting. Hallam saidtheir study could lead to ways "to manufacture microbial treatment systemsfor cleaner fuel processing or the development of harvesting approaches thatfocus on the recovery of natural gas, a by-product of oil degradation." Microbial life had earlier been detected in the La Brea TarPits in Los Angeles, although that research "was more focused on thebiodegradation properties and biotechnological aspects of the system," Hallam noted. Also, while the bacteria in Pitch Lake and LaBrea have similarities, the archaea populations atPitch Lake appear more diverse. Such research into asphalt lakes on Earth doesn't only give hintsas to what life might be elsewhere in the universe, but also what it might havebeen like in the ancient past on our planet before it adapted to oxygen. "It's primordialin that sense," Hallam said. The scientists note this miniature version of Titan on Earth is shrinkingdue in part to asphalt mining for road-paving operations. "It is adelicate balance between the need to conserve such an interesting naturallaboratory and the economic development of the island," Hallam added. "It would be something if there were away to promote ecotourism to the site." The scientists have submitted their findingsto the journal Astrobiology.